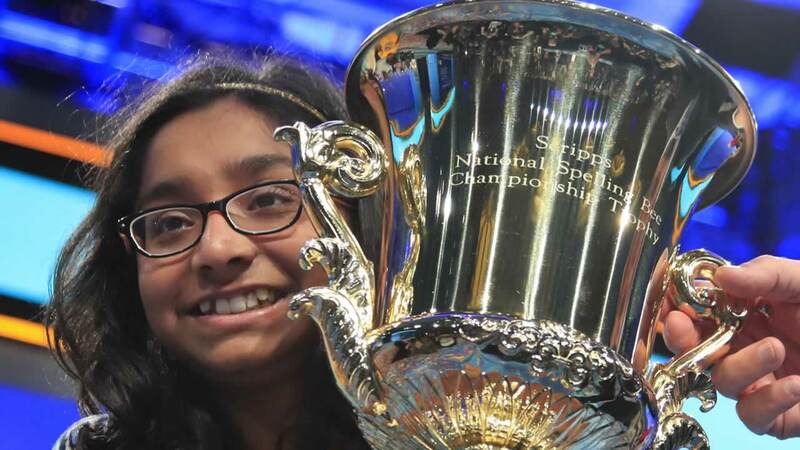 FRESNO, Calif. -- Ananya Vinay never looked all that impressed by any of the words she was given in the finals of the Scripps National Spelling Bee. The 12-year-old from Fresno, California, showed little emotion and didn't take much time as she plowed through word after word. Sometimes she would blurt out questions, with little intonation - "Part of speech?" ''Language of origin?" - and sometimes she didn't even bother. Unflappable to the end, Ananya seized the opportunity when her steely opponent, Rohan Rajeev, flubbed a simple-looking but obscure Scandinavian-derived word, "marram," which means a beach grass. She calmly nailed two words in a row, ending on "marocain," which means a type of dress fabric of ribbed crepe, to win the 90th Scripps National Spelling Bee on Thursday. "It's like a dream come true," Ananya said as she held the trophy. "I'm so happy right now." Ananya was on the radar of some veteran bee watchers but didn't come in with a high profile. She participated in last year's bee but didn't make the top 50. As a sixth-grader, she could have come back for two more years, had she fallen short. Now, she'll return only in a ceremonial role to help present the trophy to next year's winner. Mira Dedhia, trying to become the first offspring of a past competitor to win, finished third. Before Ananya and Rohan began their lengthy duel, the primetime finals were marked by surprising eliminations of better-known spellers. Shourav Dasari, a past winner of both minor-league bees, was described as the consensus favorite as the ESPN broadcast began. He had the most swagger of the finalists, at one point spelling the word "Mogollon" as soon as he heard it and turning around to return to his seat. He was felled in fourth place by a killer word, "Struldbrug," that was coined by Jonathan Swift in his novel "Gulliver's Travels" and had no recognizable roots or language patterns to fall back on.